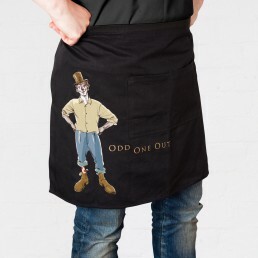 The concept behind the Odd One Out range is double edged – reflective of the use of unusual varieties and blends and in deference to winemaker, John Ellis, who considers himself a little bit different! In keeping with this brand personality, we created labels inspired by the diversity of characters that comprise the dynamic Australian wine industry. The client had a very clear vision to create a unique brand that displays a European eccentricity while being distinctly Australian; that is left of centre without being intimidating. 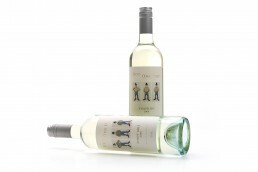 Our job was to interpret this vision by creating a label design that would reflect the quality of the wine in the bottle while maintaining the quirky Australian character of the brand. 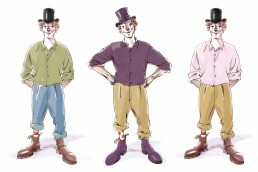 The labels feature an illustration of three Australian-esque clowns, complete with oversized RM Williams boots, inspired by old European lithographic prints, and illustrated by Nigel Buchanan. 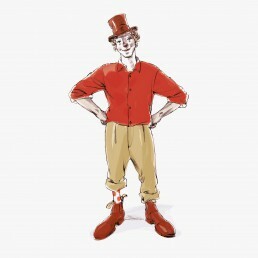 Nigel’s beautiful hand drawn illustrations are created with meticulous attention to detail. Look closely and you’ll see one character adopts a different stance to his fellow label mates – the odd one out. Look even closer and you’ll notice miniscule details – a ‘Made in Australia’ tag on the boots, a spotty sock, a cheeky expression.